Flatfoot occurs when there is a partial or total collapse of the arch. The condition can be present at birth or show up years later. Some children show no symptoms while others experience pain, cramping and awkwardness when walking. Non-surgical treatment can be used including shoe modification, orthotic devices and physical therapy. Surgery may also be necessary, depending on the type of flatfoot. A painful inflammation of the growth plate in the heel. The common condition typically develops between the ages of ages 8 to 14, when kids grow most rapidly. 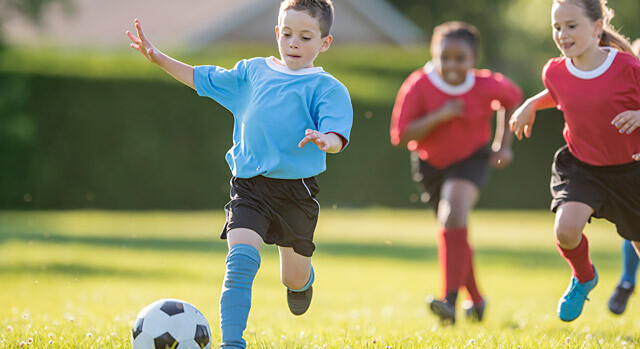 Stress on the heel bone in sports is a major cause, making children who play soccer, track or basketball vulnerable. Children who walk on their toes, have difficulty running and jumping or feel pain when the sides of the heel are squeezed may also have calcaneal apophysitis. This occurs when a toenail is curved and grows into the skin, usually at the sides of the nail. The nail irritates the skin, causing pain, redness and swelling. Ingrown toenails can occur through heredity, trauma such as stubbing your toe or wearing socks and shoes that are too tight. Trimming your nails too short can also cause a problem as skin next to the nail begins to fold over it. If the condition persists, parents should consult with a doctor and never try to dig the nail out themselves. Warts are skin growths caused by humanpapilloma virus. Warts can develop anywhere on the foot, but are typically found on the underside. A wart can be solitary and gradually increase in size, or form a cluster (mosaic warts), which are more difficult to treat. Thickened skin on the foot like a callus, tiny black dots and pain with walking are possible signs of warts. While they often go away on their own in children, some warts need to be removed with laser therapy, freezing or acid treatments.